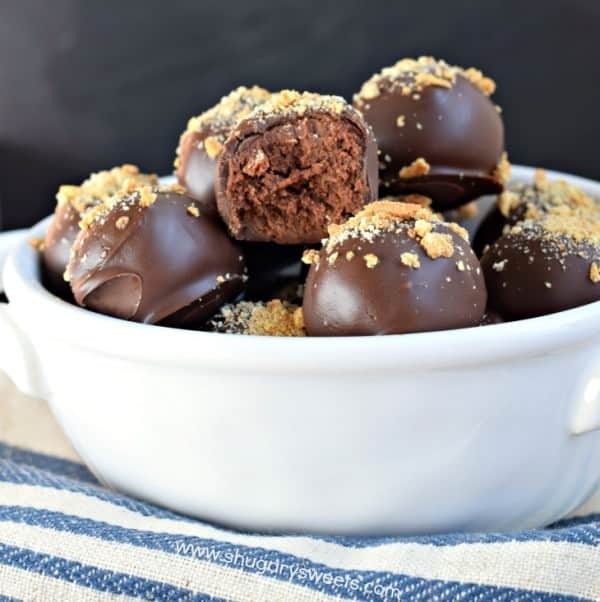 Rich and decadent, these truly are EASY Chocolate Truffles! Perfect for a delicious treat, or give as a gift. These came by accident because I am a lazy slob. Okay, that’s not really true…the lazy slob part. But, they were not a “planned thing. You see, I was making this delicious S’mores Dip last month, and after I took all my yummy photos, I placed the dip in the fridge for later. You know, later…the normal time families eat dessert (not 10 am). In the afternoon, I had a serious craving for the dip, and of course it firmed up. 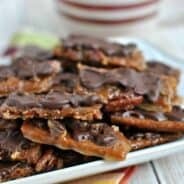 But, it struck me, this would make a delicious filling to a an Easy Chocolate Truffle. 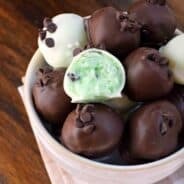 So I grabbed my metal cookie scoop and I got 48 truffles from this recipe (OMG!!). I froze these for about an hour. Then dunked them in MORE chocolate and sprinkled some graham cracker crumbs on top. These were such a hit. And while they have all the “making of a s’mores” the marshmallow just added a rich smoothness to the filling that you can’t really tell it was marshmallow. In a glass bowl, you’ll want to microwave the sweetened condensed milk with the chocolate, stirring every 30 seconds (for about 1 minute total). Add in the marshmallows and microwave again in 30 second increments. Mine took about a minute for the marshmallows to get soft. You could either stir and blend them in completely, or blend them until they are incorporated, but there are still streaks of marshmallow (this was my goal, but I failed). Refrigerate this mixture for about 2 hours. Using a metal cookie scoop (mine was a small, 1 Tbsp sized scoop), portion out your filling onto a parchment paper lined baking sheet. Freeze for an hour. Use your fingertips to roll into a smooth ball. Melt 16 oz chocolate wafer (I love Ghirardelli) until smooth, according to package directions. Using a toothpick, dip each truffle into the melted chocolate, tapping the side of the bowl gently to let the excess drip off. Place on parchment paper. Sprinkle immediately with graham cracker crumbs. Repeat until all truffles are dipped. These can be stored in the freezer for later use, or up to one week in the refrigerator (in an airtight container). ENJOY! 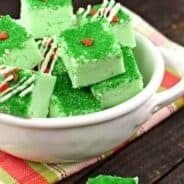 Check out some of my other favorite truffle and candy recipes. 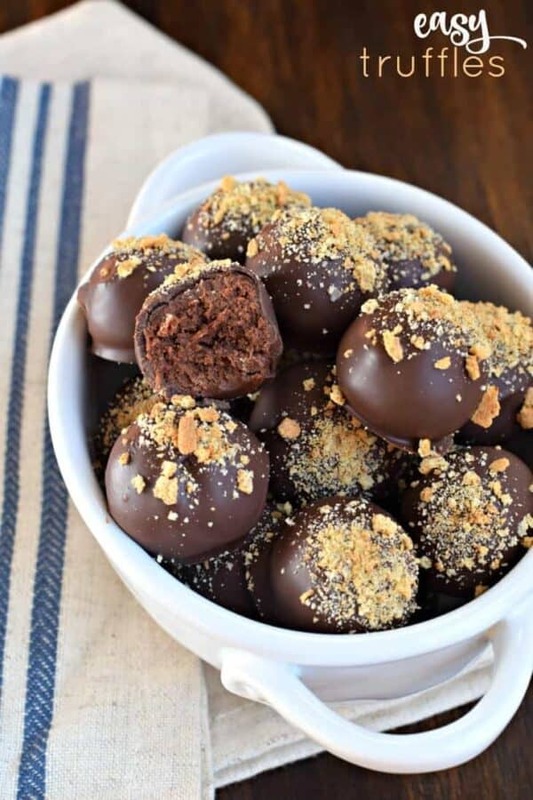 Or print this Easy Chocolate Truffle recipe from Food Fanatic. Yum! If this is the kind of recipe you create when you are lazy, you should be lazy more often! YUM… chocolate truffles well there goes my waistline. It looks so decadent and so dangerously good. No mention of the wafers? When do I add that? i added coconut hope it will work? I’m not sure what you mean. The chocolate wafers are melted and the truffles are dunked into them as the coating. Is this a dark wafer or milk chocolate wafer?